​No to borders. H​umanity and compassion should know no barriers. The poignant photograph of three-year-old Aylan Kurdi’s frail body washed up a Turkish beach has opened the eyes of many to a crisis long-plaguing migrants and refugees. The spotlight is now on Europe, whose governments are being censured by their own peoples and peoples of the world for refusing to give refugees protection and urgent sanctuary. 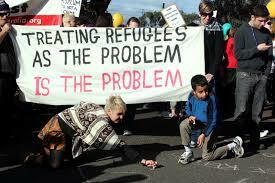 The refugee crisis, however, is not a European problem alone. Earlier this year, the world also watched in horror as thousands of trafficked Rohingyas stranded at sea were left to die, without proper food, shelter and protection, as ASEAN states refused them entry into their borders. This entry was posted in News, Statements and tagged borders, refugee. Bookmark the permalink.